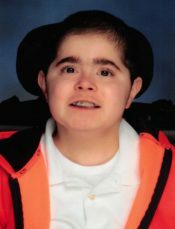 ZACHARIE AARON STEVAN TESSIER, 17 OF PENSACOLA, FL WENT HOME TO JESUS IN HIS MOTHER’S ARMS ON SUNDAY, MARCH 17, 2019 AS A RESULT OF COMPLICATIONS FROM DUCHENNE MUSCULAR DYSTROPHY. ZACH WAS A SOPHOMORE AT ESCAMBIA HIGH SCHOOL IN PENSACOLA, FL. HE WAS AUTISTIC AND IN A WHEELCHAIR BUT THAT DID NOT SLOW HIS SPIRIT. HE LOVED PLAYING VIDEO GAMES AND DOING PUZZLES. HE WAS A WELL LOVED YOUNG MAN AND TOUCHED MANY LIVES. HE LEAVES BEHIND HIS MOTHER, RENEE TESSIER; GRANDPARENTS, POLLY AND ALLAN TESSIER; UNCLE, MICHAEL TESSIER AND HIS COUSIN, MEGAN TESSIER. A SERVICE CELEBRATING HIS LIFE WILL BE 12 NOON ON SATURDAY, MARCH 30, 2019 WITH VISITATION FROM 10-12 AT PENSACOLA MEMORIAL GARDENS FUNERAL HOME. INTERMENT WILL FOLLOW THE SERVICE IN PENSACOLA MEMORIAL GARDENS. IN LIEU OF FLOWERS, THE FAMILY REQUESTS THAT MEMORIAL CONTRIBUTIONS BE MADE TO THE MUSCULARY DYSTROPHY ASSOCIATION. I love you my little sugar bear!!!! I’m gonna miss getting those snibble nibbs.. you were my blessing and special gift from God! You will always be in my heart and never forgotten. I hope you are having a great time with Jesus drinking a sprite and playing puzzles.. I will see you again soon….. Flying with Angels…we will see you soon, young man! Zach you were a blessing to everyone that had the pleasure to meet you..I’m so thankful I was one of those people..you were a amazing young man and one of the smartest young men I’ve known..I’m so thankful for the times we all shared together from the Saturday lunches to the Mardi Gras parade we just went to..Brayden and Carson enjoyed spending time with you and talking about all the games on the Nintendo switch..I know you are now in heaven walking around pain free and enjoying everything you can now do again..I miss and think about you everyday..who am I gonna talk to now about it looking like its gonna rain or your mom going the wrong way when we would go somewhere or fixing the air conditioner so we didn’t burn up in the back of the van lol..all in all we miss you Zach and will see you again one day! !We love you and your mom and will always be there for her especially through this sad time..Fly high Zach!! !